Kristin Hopkins ’15 inherited a love of musical theatre from her grandmother. “I would sit with her and watch [musicals] all day long and learn all of the songs and all of the dances that were in the shows, and then I would do them for her,” she said. Now a senior at William & Mary, Hopkins has parlayed those early experiences into a lifelong love of dance – a passion that earned her the role of choreographer for the upcoming production of Crowns, opening Thursday in Phi Beta Kappa Hall. It’s a position that’s not often held by a student, but it was a challenge that Crowns Director Artisia Green thought Hopkins was ready for. "Kristin is one of the theatre majors with whom I've wanted to work a little more closely with since she and I first worked together in the Ruined ensemble a few years ago,” said Green, associate professor of theatre and Africana studies. “I believed that Crowns would offer her an opportunity to simultaneously engage the full range of her talents in acting, singing and dancing as well as group choreography. I had witnessed some of her composition in other student laboratory productions and saw beautifully precise, graceful, and fluid work -- just one of the important touches that Crowns needed." Hopkins’ formal dance training began in kindergarten, where girls were sent to to ballet lessons while boys went outside to play. “We would be inside being little ballerinas and they would be outside playing, which I thought was more fun,” she said. Although Hopkins envied the playtime, she wasn’t soured on dance. In fact, she found she loved it. Her mother had also danced when she was younger, and she enrolled Hopkins in tap and ballet classes. “I much more enjoyed tap over ballet because ballet was so strict and I could be crazy and be fun,” Hopkins said. Dance and musical theatre continued to be a large part of Hopkins’ life as she grew up and eventually entered William & Mary, where she is majoring in both theatre and government. She began teaching classes at a community theatre in her hometown of Virginia Beach, Virginia, and, in 2013, she choreographed her first piece working with Alex McBath on an IPAX production of Exhibits from George C. Wolfe's The Colored Museum. Green saw Hopkins’ work in that play and asked if she’d be interested in choreographing Crowns. Crowns tells the story of Yolanda, a troubled teen who is sent to live with her grandmother in South Carolina and is guided by a community of church women in her search for identity. The show’s music includes gospel hymns, something very familiar to Hopkins who grew up as a member of a predominantly black, Christian church. “Every night, going to rehearsals feels like going to church,” she said. But the music also has an African undertone, said Hopkins, which is woven throughout the production with the help of a drummer. “It really helps us find the African movement within the church songs, showing that it’s all working together,” said Hopkins. And so the research began. Green gave Hopkins articles and videos about African dance aesthetics, and Hopkins soon found inspiration in the movements of everyday dances that are inherently African, she said. Hopkins discovered the ring shout, originally practiced by enslaved African people, in which participants dance counter-clockwise in a circle, moving in ways to connect to ancestors, emotions or God. Hopkins also learned about Orishas in the Yoruba religion, spirits that represent various aspects of God. Each of the characters in Crowns represents a different Orisha, Hopkins said, and she created choreography to reflect the characteristics of each. “Each Orisha has their own movement, which is very interesting to know because there are a lot of festivals that go on throughout the world that celebrate these Orishas that I had no idea about,” she said. “Artisia sent out a lot of videos of our Orishas and how they dance and how they move and where most of their weight is centered, so I used those videos to draw a lot of choreography. As she drew inspiration from research, Hopkins began creating the choreography. She’d listen to the music a few times and then allow herself to improvise dance moves, while videotaping herself. She later reviewed the tapes to figure out what worked and what didn’t, and she continued to hone the choreography after she taught it to the cast. “Sometimes you think something is so great and then you see people do it, and you’re like, ‘That did not look like what I thought it was going to in my head,’” Hopkins said. When opening night arrives, Hopkins won’t just be sitting in the audience, watching the cast as they perform the movements she created. She will be on stage, moving with them, as Wanda in the show. The character, who wears a bright yellow hat, talks a lot about her grandmother, said Hopkins. In fact, most of Wanda’s monologues are about her grandmother. Hopkins’ own, the one who inspired her as a child to love musicals, has passed away, but she won’t be far from the choreographer’s thoughts. “Every time I do a show, I think of her,” said Hopkins. Crowns runs Feb. 26–March 1, with performances at 8 p.m. Thursday, Friday and Saturday; and at 2 p.m. on Sunday in Phi Beta Kappa Memorial Hall. Thursday’s opening performance will feature a special pre-show reception hosted by the Greater Williamsburg Women’s Association and a post-show talk with photographer Michael Cunningham whose book inspired the play. Both the reception and talk are free. Tickets are $15 for adults, $12 for military, $10 for groups of 10 or more, and $7 for students and children. 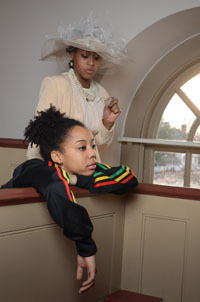 For more information, call 757-221-2674 and or visit www.wm.edu/boxoffice. Correction: The original version of this story stated that Hopkins was thought to be the first student to have ever choreographed a main-stage production. The theatre department has since learned of other students who have held that role.